Super Savings Item! 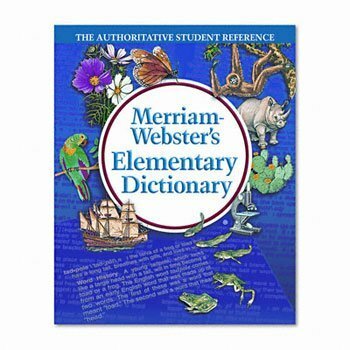 Save 33% on the Merriam Webster Hardcover Elementary Dictionary, Grades 3-5 (MER6763) by Merriam-Webster at Pear Farm. SKU: 31428. MPN: MER6763. Hurry! Limited time offer. Offer valid only while supplies last. Completely up to date! Over 32,000 entries, 600 full-color illustrations and 250 word history paragraphs. Special sections on geography and U.S. Completely up to date! Over 32,000 entries, 600 full-color illustrations and 250 word history paragraphs. Special sections on geography and U.S. presidents. Reference Book Type: Dictionary; Age Recommendation: Grades 3-5; Language(s): English; Number of Pages: 624 pages. Completely up-to-date dictionary features over 32,000 entries and 250 word history paragraphs. Special sections on geography and U.S. presidents.